Home/Blog/September – A Happy, Healthy Cat Month! September – A Happy, Healthy Cat Month! As part of activities to mark the Happy, Healthy Cat Month is September, here are several tips on how you can keep your cat healthy and happy with ease. Cat care is a specialized field of veterinary medicine and calls for the need of an expert cat veterinarian to handle some of the procedures. Whether you own a young, adult or aged cat, you will find this information not just engaging but very useful as well. Read on below to get learning or relearning how best to care for your pet this September! Cats are mainly carnivores and live off meat-eating in the wild. Their bodies are designed to process and gain all their nutrient needs from meat. However, for home cats, a premium meal of high protein and some carbohydrates will benefit your cat greatly. There are plenty of rich and healthy cat foods in stores and malls. As much as possible, consider food types that are organic because they are safer for your pet’s health in the long run. However, as much as feeding is encouraged, avoid over-doing it to prevent getting your pet over-weight. In the avoidance of doubts, you may also visit an animal hospital near you for great recommendations. A visit to a cat veterinarian keeps illnesses away better before they even develop. When your cat visits the veterinary often, there is a high probability that any on-coming health complications will be nipped n the bud. Your kitty might not enjoy the prodding, rubbing and all that comes from a cat veterinarian’s prying fingers and equipment, but this is a little price to pay to keep it in good health. Visiting the veterinarian will involve body checks, laboratory checks on body samples, grooming, and even neutering, etc. These check-ups and vaccinations prevent diseases in the future. In all, vet visits are necessary if you want your cat to be in the best health this September and beyond it. Cats enjoy playing too, though not as much as dogs they do. For entertainment and fun, you can get some toys for your cat to play with to keep their minds engaged. Toys could be soft, furry dolls that they can scratch, paw or jump on as they like. Cats love climbing and jumping a lot so a few hangers can also be designed for it in the corner of the house where it can have some fun. You may also want to consider the fact that cats love sleeping a lot. Consider getting some soft pillows where they can snuggle into for a lovely, afternoon nap after padding and jumping about. A clean pet makes for a healthy pet; if your cat is often clean, it stands more chances of not getting infected by contagious germs. Though cats naturally try to clean themselves some effort from you will still go a long way. You can bath your cat once a week to keep it clean. A tooth’s cleaning though not so easy to do also a great way of keeping your cat clean. Cats with bad dental care usually end up suffering other complications down the road. You may have to visit your cat veterinarian to carry out this procedure for you. Several League City Animal Clinics offer professional dental and cleaning services to keep cats in good health. In addition, your cat’s litter box should be kept as clean as possible always. It should also be kept where they can see it without difficulty whenever they need to use it. Spaying or neutering your cat saves you the trouble of managing your cat’s reproductive cycle which can bring unwanted results. By spaying your cat, you are doing it a world of good. Spaying or neutering reduces the chances of disease infection, hormonal imbalances, unwanted litters, and other negative consequences. This should be done when your cat is about 3 months old by highly recommended cat veterinarians League City for the best results. As much as cats try to act independent, they still enjoy being carried about and petted like other pets. Take out time for some bonding with kitty every day. If you are a very busy person, you might consider getting a friend or neighbor to help you out. Alternatively, a pet sitter from a trusted service can offer attention to your cat in your place when you are unavailable to do so. When you can, carry your cat, play with it, pet it and show it some attention to improve and strengthen your bond and familiarity with it. 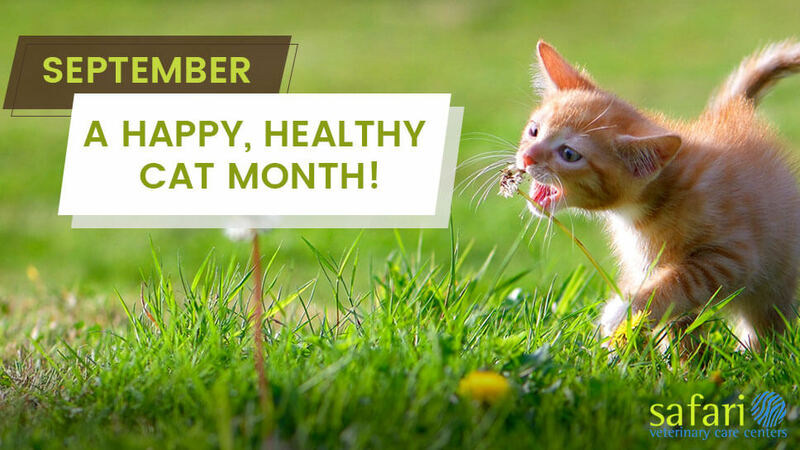 September is Happy, healthy cat month! If you follow the tips above, it is certain that your cat will have more chances for an excellent happy and healthy life!